Hello. Hope your Saturday is going well. We are leaving for the Hockey Game shortly. Have been working most of the day on getting some things packaged up for door prizes at a group my sister belongs to. Tomorrow I need to make some gift tags for our Chirstmas Party at Stamp Club for an exchange. Ohhh Sue what beautiful,i love the image and colours. So cute...love all the gold details too! Ooooh, this is just beautiful! I love this cute image and papers and design are gorgeous. I love that image, Sue! Very cute bag! You are such a tease! LOL!! Love the gift bag, and that image is just so sweet! Sue, this is so elegant -- the way you have put this together would make any "young" woman want to receive it -- even without the thoughtful gifts to be tucked inside. I guess, I'm not on the list since I am not a "young" woman. But I've reaped the benefit by seeing it first! LOL. 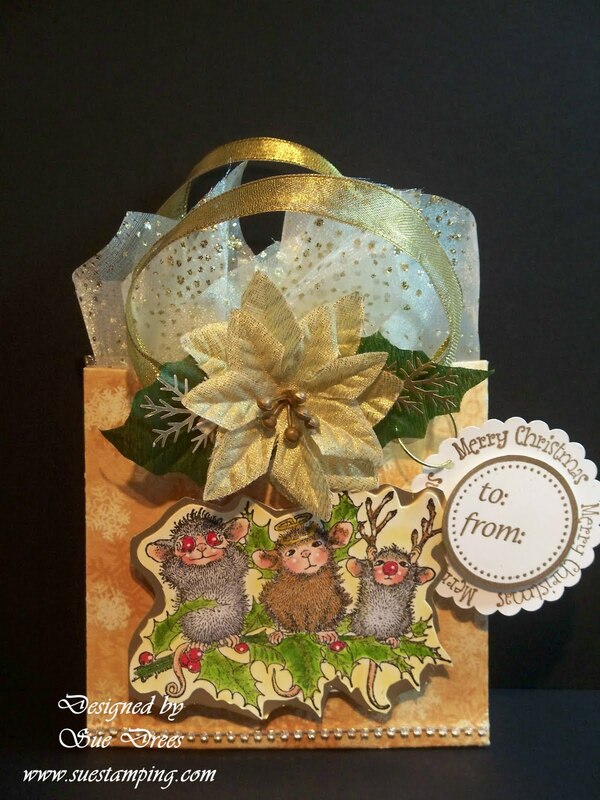 Hi Sue this is a stunning bag & this image is way to cute..great lush papers & gorgeous finishing touches..thanks for joining us at HM&F this wk. Awwww, they are sooo darn cute, those little buggers. Your bag is precious, love those colours and Sue's amazing mousie colouring, love love love love it!! What a gorgeous little bag and that image is soooooo cute!